Our Field Services team does not perform installation services. We can recommend qualified and reputable electrical and mechanical contractors that are experienced with your particular site conditions to provide a turn-key solution. We work closely with the contractors to provide the necessary drawings and equipment required to complete the installation. We offer product training seminars from time to time and welcome inquiries to become a recommended installer of our products. Contact us to learn more. Generator and Automatic Transfer Switch installation requires specialized knowledge and training and must be performed by a competent, licensed electrician or a qualified installation technician who is familiar with all applicable codes, standards, and regulations. Generator projects must be engineered so that the generator will perform as intended under the expected conditions. 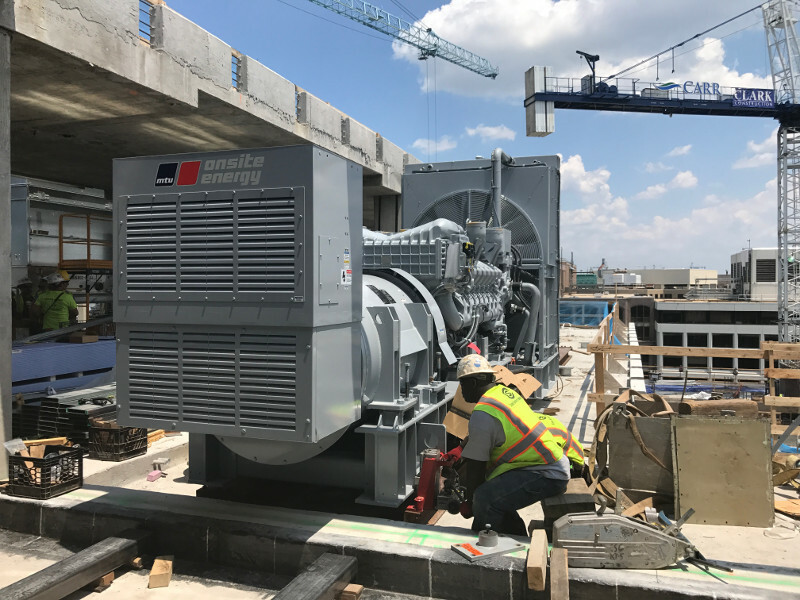 This includes sizing the generator set to accommodate the expected loads and selecting the right equipment to meet the application and unique site requirements. Application and design is an engineering function generally done by specifying engineers, who are responsible for the design of the system and the selection of the materials and products required. Curtis Engine is an equipment supplier and authorized distributor of MTU Onsite Energy and ASCO Power Technologies products. As such we provide expert advice, all of the components required to install the power system, and factory-authorized commissioning, warranty, and maintenance services. Obtain the appropriate documents and information and get it to the right people. Submittal documents including the Product Specifications and Installation Drawings are provided by Curtis Engine. Installation Manual can be found on our website. Lifting Provisions and Mounting Guidelines can be found on our website. Local Codes and Standards that apply to the installation from the Authority Having Jurisdiction (AHJ). Installation Validation Checklist is available on our website. Owners Manual is included with the equipment or provided by Curtis Engine. Planned Maintenance Agreement is available from Curtis Engine. Select the location and prepare the site for the generator set and accessories. Review the dimensions and the weight of the genset. See the Installation Drawings in the Submittal. Determine the stub-up locations for the electrical wiring. See the Installation Drawings in the Submittal. Determine the generator pad or base dimensions and composition and mounting requirements. See Sections 3 and 4 of the Installation Manual. Ensure that there is adequate ventilation for cooling, induction, and exhaust air requirements. See Section 5 of the Installation Manual. Review the engine exhaust system installation considerations for back pressure, piping, and placement. See Section 6 of the Installation Manual. Review the specific engine exhaust requirements for the generator set. See the exhaust flow and temperature requirements on the Product Specification sheets in the Submittal. Review the fuel system requirements and components. See Section 7 of the Installation Manual and the Product Specification sheets in the Submittal. Review the electrical system requirements including AC Power Output cables, batteries and battery cables, transfer switches and switchgear, and other accessories such as remote annunciators, block heaters, battery chargers, and louvers. See Section 8 of the Installation Manual and the Product Specification sheets in the Submittal. Ensure that the area has enough room to get the generator in and out, should major overhauls or replacements be required, and that there is adequate room for maintenance and repairs (at least 3 feet of clearance or width of enclosure door). See Section 9 of the Installation Manual and the Installation Drawings and Product Specification sheets in the Submittal. Schedule and receive the equipment. Coordinate the delivery date and requirements for offloading and storing the equipment (if necessary). Contact your Curtis Engine project representative. Prepare to offload the generator set and set the equipment in place. See the Lifting Provisions and Mounting document on our website. Inspect the equipment for any signs of damage. If damage is suspected, document the damage on the bill of lading, take pictures of the damaged area, and notify Curtis Engine immediately. Secure the generator keys, owners manuals, and any additional loose accessories shipped with the generator set. If requested, we can store these items in our warehouse and provide them at start-up or at your direction. Install the equipment and accessories. Review the Lifting Provisions and Mounting Guidelines and secure the generator set to the pad or base. The document is available on our website. Make the appropriate AC Power Output connections. See Section 8 of the Installation Manual and the applicable Code requirements (i.e. NEC). Run the appropriate AC Power Accessory and DC starting and control circuits in separate conduits, but DO NOT make these connections. The Curtis Engine start-up technician will make the final connections during commissioning. See Section 8 of the Installation Manual and the Installation Drawings in the Submittal. The proper fuel system installation is critical for proper system operation and to meet safety requirements. See Section 8 of the Installation Manual and consult a licensed plumber, mechanical contractor, or experienced installer to ensure that all local and national regulations and codes are met. Coordinate the delivery of fuel with the fuel supplier. Ensure that enough fuel is available to complete the testing requirements during start-up and commissioning. Schedule the start-up and commission the system. Complete the Installation Validation Checklist and return it to Curtis Engine. Contact your Curtis Engine project representative. Start-up is a scheduled service call (typically one visit) for the period of time agreed to in the project proposal and quote. If an improper or incomplete installation requires the technician to wait longer than 30 minutes to begin work or to schedule another visit beyond what was agreed to, the additional time and visit may be invoiced. See Start-Up and Commissioning on our website for the start-up request forms and checklists. Maintain and test the system. Proper maintenance and testing is required to ensure that that the equipment continues to perform as it was designed. It also ensures that warranty remains valid and that you are in compliance with any applicable Codes and regulations. Contact us to obtain a Planned Maintenance Agreement customized to your needs and equipment. This Installation Guide provides general instructions for installing your MTU Onsite Energy generator set properly. It is essential that every person who works on or with the generator set be completely familiar with the contents of this manual, and that he/she carefully follows the instructions contained herein. Each installation may require some modification of the suggested guidelines in this manual. Installations must be consistent with locally applicable standards and take into consideration safety guidelines and measures. Following this guide will result in an efficient and reliable installation. Carefully follow all procedures and safety precautions to ensure proper equipment operation and to avoid bodily injury. Read and follow the Safety Precautions section at the beginning of this manual. Information in this publication represents data available at the time of print. MTU Onsite Energy reserves the right to change this publication and the products represented without notice and without any obligation or liability whatsoever. All instructions and diagrams have been checked for accuracy and simplicity of application. However, the skills of the installer are most important. Curtis Engine and/or MTU Onsite Energy does not guarantee the result of any installation contained in this manual. Nor can Curtis Engine or MTU Onsite Energy assume responsibility for any injury or damage to property. Persons engaging in installation do so entirely at their own risk.